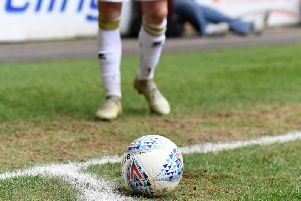 It was not to be a fairytale of New York as MK Dons threw away an early lead against Rotherham and fell within three points of the League 1 relegation zone. Chuks Aneke's ninth minute free kick was cancelled out by a shambolic Semi Ajayi equaliser 11 minutes later, before Will Vaulks fired home a cracker on 29 minutes secured all three points for the Millers. In a game void of much quality, Dons barely came close to snatching an equaliser and drop to 19th in the league, just three points above the drop zone. After hobbling off against Scunthorpe last Saturday, Scott Golbourne was unable to recover from his hip injury in time to face Rotherham at the New York Stadium, with Scott Wootton replacing him and Joe Walsh shifting over to left back. The rest of the starting line-up remained the same, while the bench saw Ouss Cisse, Alex Gilbey and Robbie Muirhead all return. Brandon Thomas-Asante's hat-trick for the U23s on Tuesday against Colchester also saw him named amongst the substitutes. Having squandered 30 chances against Scunthorpe a week earlier, Robbie Neilson called for his team to be more deadly in front of goal, and with their first chance they were in front when Chuks Aneke bent his free kick past Marek Rodak after nine minutes to put Dons ahead. Rather than going to chase a second though, the visitors invited pressure onto them with a string of Rotherham corners causing a sense of unrest at the back. And from one of those indecisive moments, Rotherham's equaliser was gifted to them. Aneke, Kieran Agard and Lee Nicholls all tried and failed to clear the ball convincingly, with the keeper only able to flap at the loose ball, allowing Semi Ajayi to tap into the empty net to draw the home side level after 20 minutes. Dons looked nervous at the back and we lucky not to be behind when Wootton gave away possession needlessly on half way allowing David Ball to break, only for a late interception from Conor McGrandles to deny the striker getting a shot away. There was little anyone could have done about Will Vaulks' effort on 29 minutes though as he rifled the Millers in front, lashing home from the edge of the box into the roof of the net. The game was far from an attractive one. Clearly featuring two teams out of form, neither kept the ball well, touches were poor, time on the ball was short lived and fouls were plentiful, but chances were few and far between. Rotherham should have been high and dry two minutes after the restart when Ryan Williams broke clear of the Dons defence and with two in support, picked out Jerry Yates eight yards out for what should have been a tap in, only for Nicholls to make a remarkable save to deny the Millers, diving instinctively to his right to get a hand to it. With the introduction of Alex Gilbey and Gboly Ariyibi, Dons began to creep back into the game. They'd have probably been level too just two minutes after the latters' introduction, had Gilbey looked up when retrieving Agard's spilled strike and picked out the winger rather than trying to go it alone, drawing a routine save from Rodak. It was as close as either side would come in the second period though. Joe Mattock fizzed a shot over for the home side, which had Nicholls scrambing, and Jonson Clarke-Harris stung the keeper's palms in stoppage time, but there was little festive about this one.